Ye Olde Green Wave Forum • View topic - Any News on Weekend Visitors? Any News on Weekend Visitors? Post subject: Any News on Weekend Visitors? Very quiet with signing date around the corner. Any news on the weekend visitors? Post subject: Re: Any News on Weekend Visitors? Coach Fritz keeps a tight lid on names. I do know we had some in this weekend..
Syracuse, N.Y. -- One of Syracuse football’s top priorities this offseason is to bolster the offensive line via the graduate transfer market. The Orange loses both of its starting tackles -- Cody Conway and Koda Martin -- going into 2019, as well as starting guard Aaron Roberts. Head coach Dino Babers made it clear that the program will target an offensive tackle with experience and immediate eligibility during a pre-bowl media availability. Syracuse extended an offer -- its first public one -- to a graduate transfer offensive tackle on Tuesday: South Alabama’s Ryan Alexander. The 6-foot-4, 308-pound Alexander has started 28 of the Jaguars last 29 games, serving as USA’s right tackle over the last two years after starting four games at left tackle in 2016. He was named all-Sun Belt Conference honorable mention after a redshirt junior season in which he posted a team-high 46 knockdown blocks and received an 84 percent assignment grade, according to the school’s athletic department. Alexander, who is pursuing an undergraduate degree in interdisciplinary studies, has also announced offers from Rutgers, SMU, Tulane, Charlotte and Liberty. A Floral Park, N.Y., native, Alexander attended in Holy Trinity Diocesan High School in Hicksville, N.Y., where he was a standout tight end. He caught 40 passes for 400 yards and three touchdowns as a junior in high school before attending Jireh Preparatory Academy in Matthews, N.C.
Malik Tolbert has committed to Marshall. Zach Edwards visited Louisville this past weekend. Really hoping we can get his last visit this weekend. Jacquez Norman looks like he will be visiting Mississippi State this weekend. Dal'Mont Gourdine (6'6 260 DE from South Carolina) visited this past weekend and put Tulane in his final 3 with UConn and Coastal Carolina. He had a visit set up to Rutgers for this weekend that he cancelled after his Tulane visit, so that bodes well for us. Other offers of note are Colorado State, Nebraska and UCF. We’ll see what he does. From his hudl I say his size is exaggerated, by an inch and ten or so pounds, which is SOP for recruiting. Still an okay size for a FR DE prospect at 6'5" 250#--assuming he can move, can add muscle, etc. He's a very good athlete....good basketball player. The list of his final 3 doesn't jive with other supposed offers... Methinks some of those offers were/are not actually on the table. Some of them are off, for sure. Gourdine is ranked one slot ahead of Cooper Dawson, the other SC DE we were recruiting who ended up at Syracuse. He's definitely a solid AAC caliber player. When they list a kids offers it could be as far back as the summer. In the late signing period most only have a few schollies to offer and will look to their needs they didn't hit on in the early period. Perhaps. Could also be a we'll play you here they want you there thing about playing on the outside or inside at DT. Who knows maybe they want to move him to o-line. This linebacker, Zach Edwards, appears to be an intruging prospect. 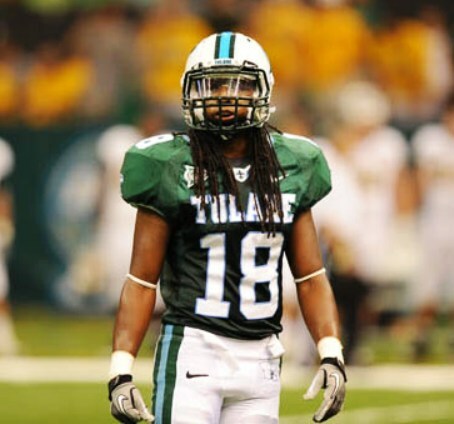 His Twitter has a photo from Jan 21st of him posing in Tulane gear. He visited Louisville last weekend but has not committed. Louisville hosted several visitors last weekend so it’s possible Edwards hasn’t yet been formally offered by them. Could be a numbers game. I would like to see Tulane add a quality linebacker or edge rusher for signing day.